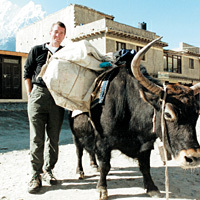 John Wood ’89 delivers books via yak in Nepal, 2002. John Wood ’89 is immersed in what he calls “the second chapter” of his adult life, and there’s no turning back the pages. In 1998, the former Microsoft executive hiked the Himalayas of Nepal. His “exotic vacation” turned somber as he discovered the appalling scarcity of schools in this impoverished nation. The realization led him to quit Microsoft and, in 2000, found Room to Read, a San Francisco-based nonprofit devoted to building libraries and schools in Cambodia, India, Nepal, Vietnam and Laos. By spring 2002, Room to Read had built 15 schools, 150 libraries, donated more than 90,000 books to needy children and established 40 long-term scholarships. Today, the organization recently completed its 100th school and its 1,000th library, donated more than 500,000 books and established 900 scholarships for girls, who Wood says are the last to receive an education in their countries. Most people, he says, don’t realize that one-seventh of humanity cannot read or write. “I don’t see how we’re going to solve the world’s problems without literacy,” says Wood, who is also president and chairman of Room to Read. He says the organization’s long-term goal is to build at least 25,000 libraries and schools to provide at least 10 million children with an education. Room to Read’s biggest contributions to date are a $200,000 grant this year from the Skoll Foundation and a $300,000 grant in 2002 from the Draper Richards Foundation. Wood says his organization operates by hiring “smart entrepreneurial” individuals who live in the countries that Room to Read serves. These entrepreneurs then locate and work with communities that need libraries and schools. The communities co-invest by way of land, volunteer labor and small cash donations. Room to Read supplies the bricks, mortar and blueprint. “Fortunately, our model is so efficient that we can build a school for between $6,000 and $12,000,” Wood says. “In Nepal, that’s $10 per child. In America, it would cost 100 times that amount.” He says seven of his Class of ’89 classmates at Kellogg contributed $1,000 to endow one of Room to Read’s first schools. In October, Time magazine named Wood and the Room to Read team one of its 20 “Asian Heroes of 2004.” Earlier this year, Room to Read was one of 20 recipients of the inaugural Social Capitalist Awards given by Fast Company in partnership with The Monitor Group. With requests pouring in to Room to Read from Cameroon, Bangladesh and Ethiopia, the organization’s success story is still being written.